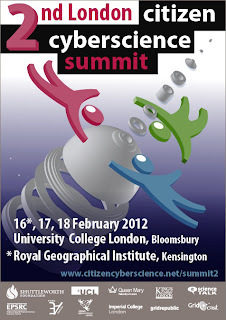 The London Citizen Cyberscience Summit in 2010 brought together for the first time volunteers and scientists from a wide range of Web-based science projects, ranging from volunteer computing (SETI@home,ClimatePrediction.net) to volunteer thinking (GalaxyZoo, Herbaria@home) to volunteer sensing (EpiCollect, NoiseTube) and much more. Historians, journalists, teachers and businessmen all brought their angle on citizen cyberscience to the event. Above all, it was a chance for the some of the millions of volunteers who make citizen cyberscience so successful to tell their story. 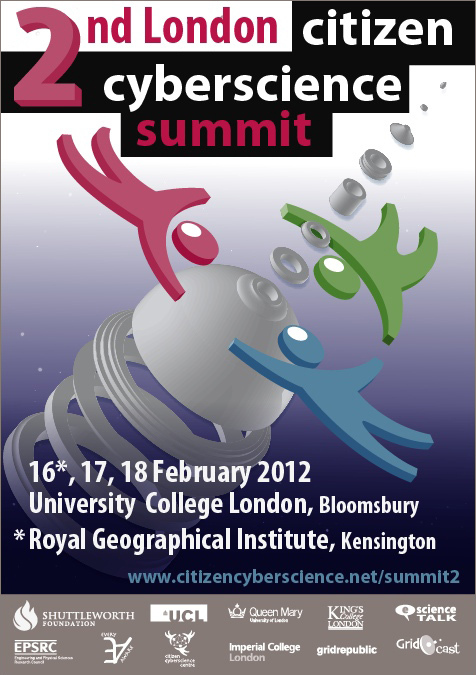 The Second London Citizen Cyberscience Summit, 16-18 February 2012, promises to be just as pioneering in its scope, and even more innovative in its format – ranging from classical academic seminar on the first day, through to full-fledged open hardware hackfest on the last. It will take place at the Royal Geographical Institute (on the 16th) and at UCL (17th and 18th), in London. On Day 1, we set the scene. (Thursday 16th February 2012, Royal Geographical Institute). Meet some of the leading figures in citizen science and explore the process of public engagement and participation, outreach of citizen science to the developing world, and the undertaking of "extreme" citizen scienceprojects, in rain forests, arctic tundra, or urban jungles. On Day 2, we look beneath the surface. (Friday 17th February 2012, UCL). Experts will discuss thehardware and software that powers citizen cyberscience. There will be a panel discussion with citizen scientists on why participation and engagement, and a showcase of new and future citizen science projects. In the evening, we'll start planning the next day's hands-on sessions. On Day 3, we get down to business…together! (Saturday 18th February 2012) This will include furtherunconference sessions, and a hackfest for development of hardware and software prototypes, demos and mock-ups, with awards for the most innovative creations!